WARNING: This post contains photos and information regarding deceased animals. 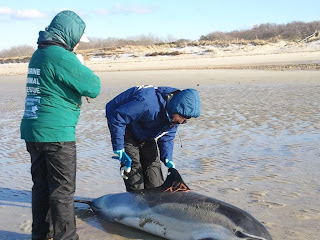 179 short-beaked common dolphins stranded on Cape Cod in the past 5 weeks. 108 of these animals were already deceased when they were reported or found on the beach by staff and volunteers. You may be wondering what happens to these animals. Although a necropsy, or post-mortem exam, was performed on some of these animals to try to identify the cause of death, unfortunately a necropsy could not be performed on all carcasses available as live animal's continued to pull all staff and volunteers away from the lab and into the field. IFAW's Marine Mammal Rescue Program, with the help of their volunteers, collect basic data on each carcass, just like we do when deceased marine mammals wash ashore in our territory. 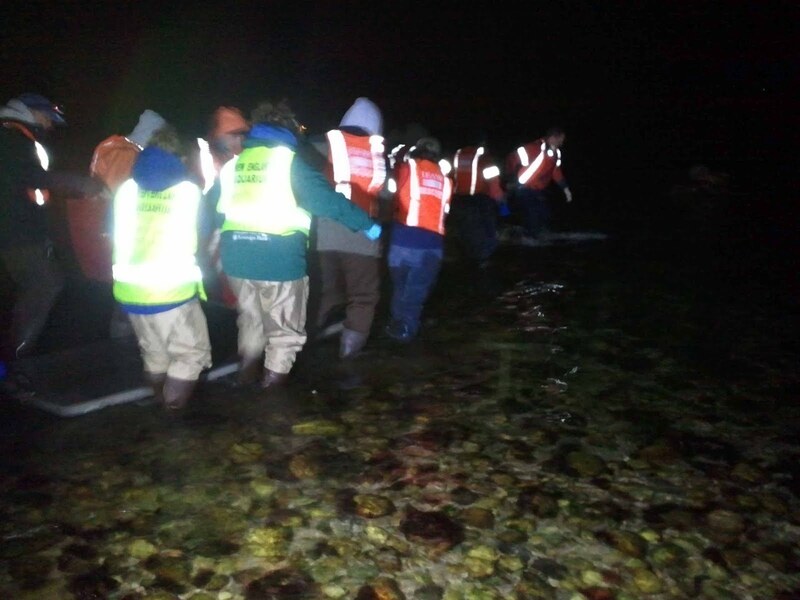 Since so many dolphins were stranding on a daily basis, volunteers and staff would scout particular areas in search for carcasses in order to collect the basic data. This information proved important to collect as it helped IFAW better grasp the magnitude of this unprecedent stranding event. They can also use these data at a later time to better understand factors contributing to the strandings, such as group dynamics. 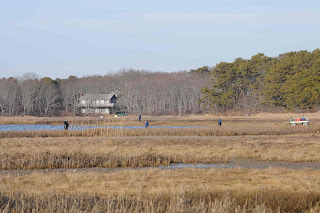 The above photo is from standing in the marsh of Lt. Island in Wellfleet. 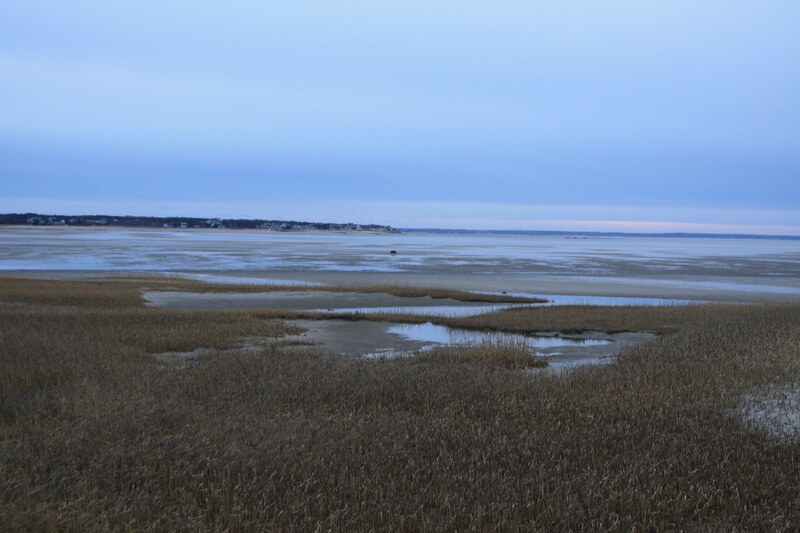 The tidal fluctuations and mud flats make this island a popular location for dolphin strandings. 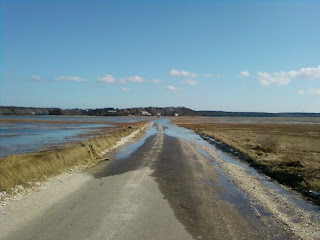 With only a small wooden bridge to access the island by vehicle, which isn't accessible at high tide (perhaps some forshadowing? ), my team and I were assigned to spend some time here in search for carcasses as well as monitor the bay for live dolphins. So what happens when we find a dead dolphin? When a carcass is found, we collect basic data on the animal such as location (latitude and longitude), gender, total body length, phase of decomposition, and a skin sample is collected. We also examine the animal externally and note nutritional condition and any unusual pathogies. 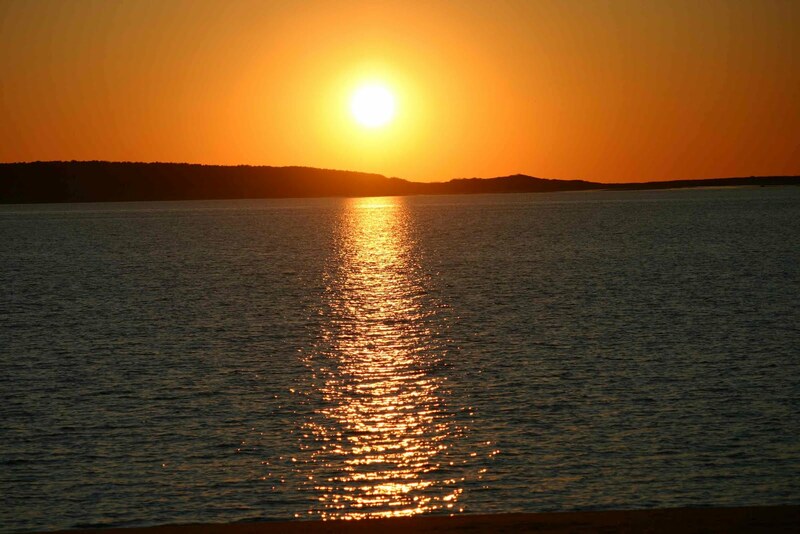 All this information is gathered and will be submitted to NOAA, where a database is utilized to organize this information for future research or monitor stranding trends. Above, Katie and I collect information on this common dolphin (this was actually a case in Brewster, but similar to the cases we found on Lt. Island). 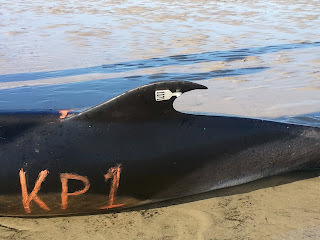 After collecting the data we mark the animal using a paint stick (note the orange 'KP1' on the side) and apply a tag to the dorsal fin. We do this to keep track of which carcasses were already responded to. With over 100 animals to work with, we do not want to repeat our efforts and unfortunately we could not collect every carcass for a full necropsy. We use different color tags for dead animals than we do for live, so the white tag on the dorsal fin, seen in above right photo, indicates a dead animal we responded to. Each organization uses a different color and within the organization different colors are used to differentiate between a live stranding and a dead one. For example, IFAW uses orange dorsal fin tags for live stranded dolphins that are released. This is valuable if it is resighted in the wild as seen in an IFAW case here, or if the live animal restrands. One of the days on Lt. Island, we split up into teams to look for carcasses when a pod of 100+ live dolphins were swimming toward shore. IFAW's team was able to quickly get in their boat and herd these animals successfully. Some NEAQ volunteers and myself were sent to monitor the herding efforts from Lt. Island while other teams were dispatched to other locations for monitoring or for live animal response. You can read more about IFAW's herding techniques in Connie's blog. 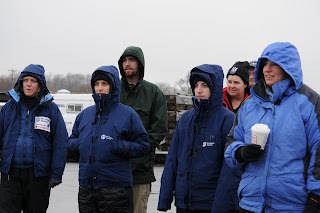 Above, after IFAW successfully herded the dolphins, myself and NEAQ volunteers Maria and Taylor snapped a quick photo before heading off to assist in releasing 2 live animals that stranded in Brewster. See Connie's post here on that release. The day after the above photo was taken I went back to Lt. Island with another team to finish up the data collection and make sure those live dolphins weren't back in the area. We worked on the other side of the island and found four additional carcasses that were not tagged, indicating they were new animals from the 7+ we found on this island in the previous days. 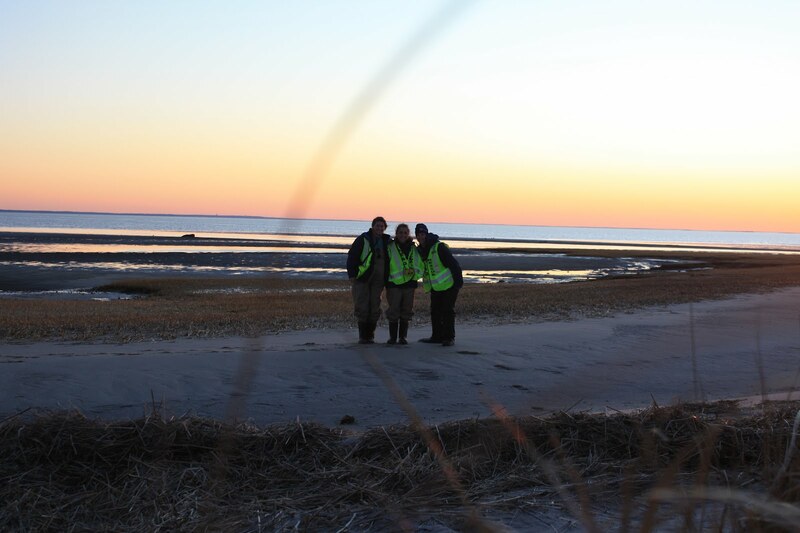 It was getting to be high tide, so we worked quickly to finish data collection and get visuals on the bay in preparation for potential live dolphins in the area. Luckily there were no live animals that we could see. High tide came and went and we were ready to head back to meet up with the IFAW group for our next assignment when...wait...where did the bridge go? We ended up being stranded temporarily (photo above), but don't worry, the tide receded quickly (and gave us more time to double check the area) and we eventually made it off the island. The 'dolphin' turned out to be a harbor porpoise. We monitored it for quite some time until we lost sight of it. With the sun starting to set and no sign of the animal, we decided to call it a day. Luckily, I haven't been back to that island since. The numbers of strandings have dwindled down, but there is still a large amount of data to be organized, necropsies to be performed, and gear to be restocked and cleaned for the IFAW team. They have done amazing work with this mass stranding. We still need to touch on reasons why mass strandings occur (i.e. there have been questions about Navy sonar being a cause but see IFAW's blog here for an explanation) so check back! As promised, I am catching you up on the dolphin rescue efforts. The photos below were taken last week in the heat of the ongoing rescues. 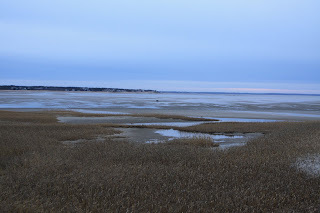 On this particular day it was snowing hard on Cape Cod so please forgive the snow effects on the photos. 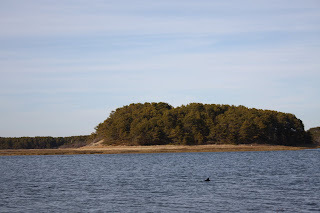 On this day, we received a report of one live dolphin in Wellfleet Harbor. After doing a search of the harbor we found that there were actually five dolphins. With an incoming tide on our side, it was the perfect time to herd these animals to the safety of deep water. The photo below shows three of the five dolphins swimming together. Fund for Animal Welfare (IFAW) launch the rescue inflatable. The first order of business was to bring the dolphins together. A group of three appeared to be staying together however two others were swimming randomly apart from the group. Three dolphins swim in formation in the photo on left. 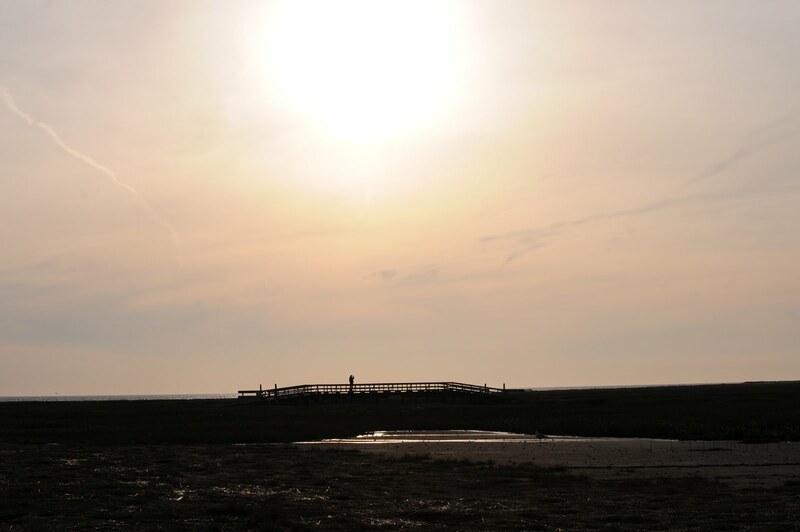 On the right, a lone dolphin passes a desolate beach. Brian and CT maneuver the inflatable carefully and skillfully during the herding. The idea is to keep the boat between the beach and the dolphins. 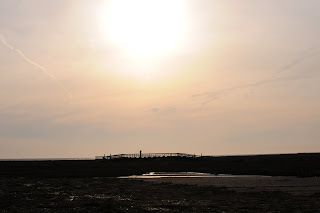 In addition to using the boat to block the beach, acoustic deterrents are sometimes used. In the photo below you can see a rope hanging (just forward of the center area of the boat) leading up to Brian's hand. You can see just a little of the acoustic device, called a pinger, dangling in the water. Brian (in the front of the inflatable) raises and lowers the acoustic device based on his behavioral observations of the dolphins. Whenever there are boat operations underway spotters are used for added safety. In this case the boat was so close to shore we had a good visual on the vessel team, despite the steady snow fall. An IFAW volunteer observes the herding activities. As the boat team was increasingly successful in herding the dolphins to deeper water we turned to binoculars to monitor their safety and progress. We also had radio and cell phone contact with them throughout the operation. 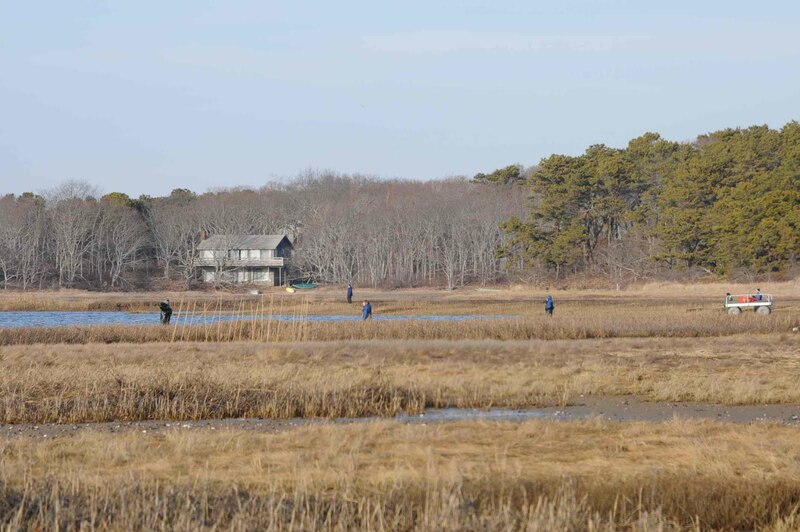 In the photo below Julika Wocial, a biologist from the Riverhead Foundation for Marine Research and Preservation (RFMRP) on Long Island, keeps a visual on the vessel team as they progress from the shoreline. out of the harbor and into deeper water. The dolphins were last seen heading out to sea. RFMRP watch and wait as the boat team returns to the dock. This event was exhausting on the IFAW staff and all of us who came in to help them. The IFAW staff certainly took the brunt of the response. If a picture really is worth a thousand words then the photo below gives an extensive description of the exhaustion of the rescuers involved in this massive effort. 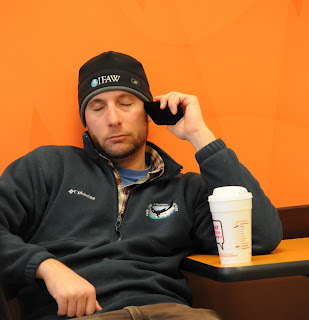 CT Harry, a marine biologist with IFAW nearly falls asleep while listening to his messages after a long day of herding dolphins on the water - I love this picture, it really does say it all! It's been an extraordinary dolphin stranding season on Cape Cod. 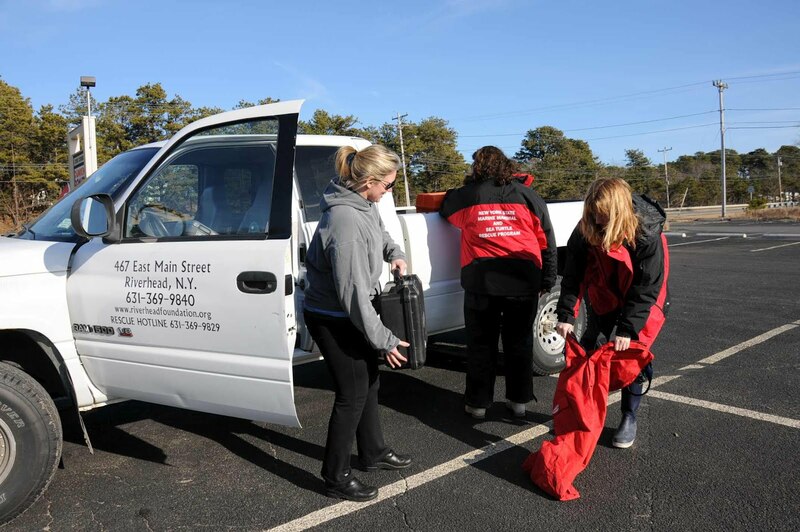 Learn more about this season's rescue efforts here. 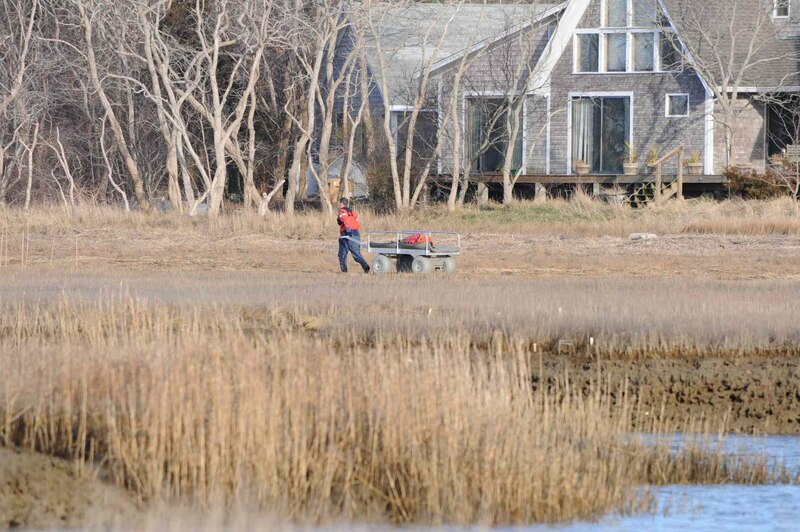 As you probably already know from the extensive media coverage, dolphins are still stranding along Cape Cod shores. We continue to support our colleagues at the International Fund for Animal Welfare (IFAW) in their efforts to save as many dolphins as possible. It is important to note that we are not able to blog about the event in real time because we are too busy responding. 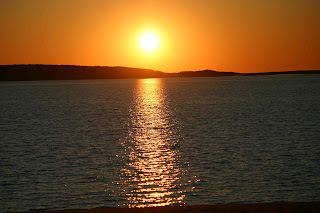 In that light we will be blogging about our experience in this massive rescue effort but it will not be in real time. 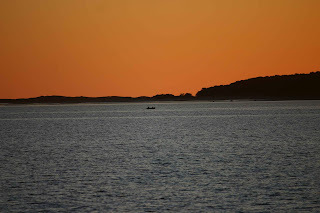 Below the sun sets over the harbor as teams continue to respond to live dolphin reports. 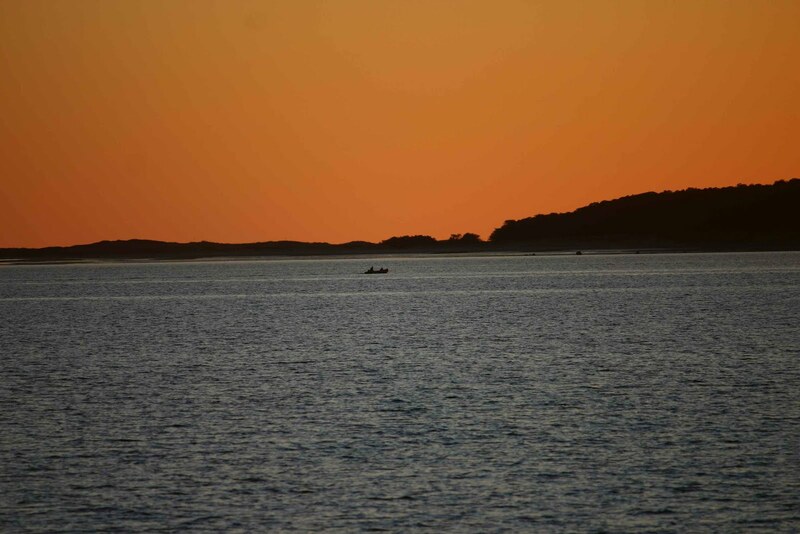 In the Photo below the IFAW rescue boat heads back to the dock after herding several dolphins out of the bay. 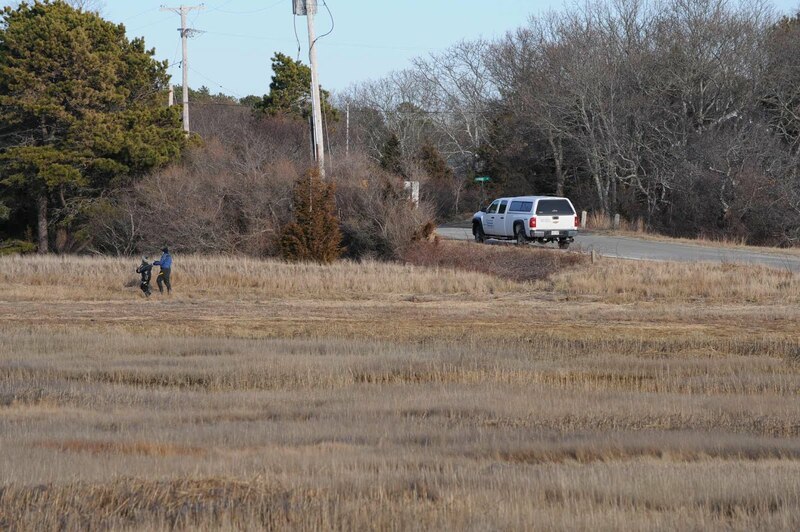 While this was taking place more dolphins were stranding at another location on the Cape. Teams were dispatched to that location for rescue and release of those animals. We generally do not initiate response after dark however if we are in the middle of a rescue effort and it is safe to continue we will do so. The safety of our rescuers is our main priority. 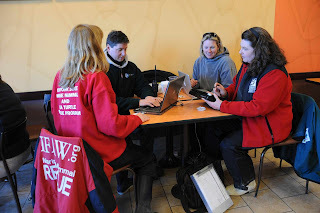 IFAW and NEAq staff and volunteers train together to ensure our safety protocols are clearly understood and followed. My favorite line when I'm training safety is: "Everyone is a safety officer" - so true. 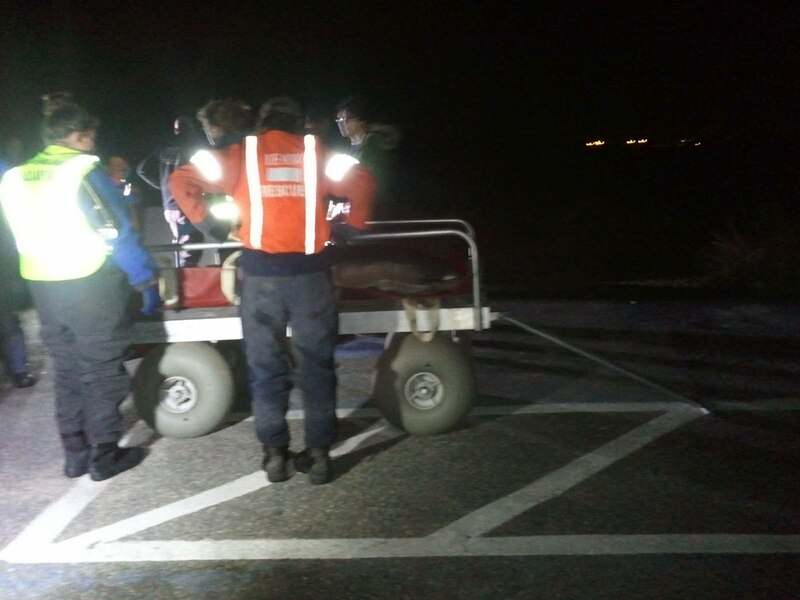 In the photo below Brian Sharp, IFAW stranding coordinator prepares to put on his safety vest while the other rescue staff keep an eye on the dolphin in the cart. Reflective vests are just one of the many personal protection equipment (PPE) required for responding in low light or after dark. In the photo below the team prepares to bring another dolphin down the the beach. A pre-release site is set up on the beach with a foam pad for each dolphin. This keeps them comfortable until all the animals are lined up on the beach so they can all be released together. In the photo below on the left the team lifts the dolphin off the foam pad for the walk into deeper water for the release. In the photo on the right you can see the foam pad as the team walks away. You can also see another team in the background. Those of you concerned about ocean trash do not worry, the foam pads are collected by volunteers so they do not float away. 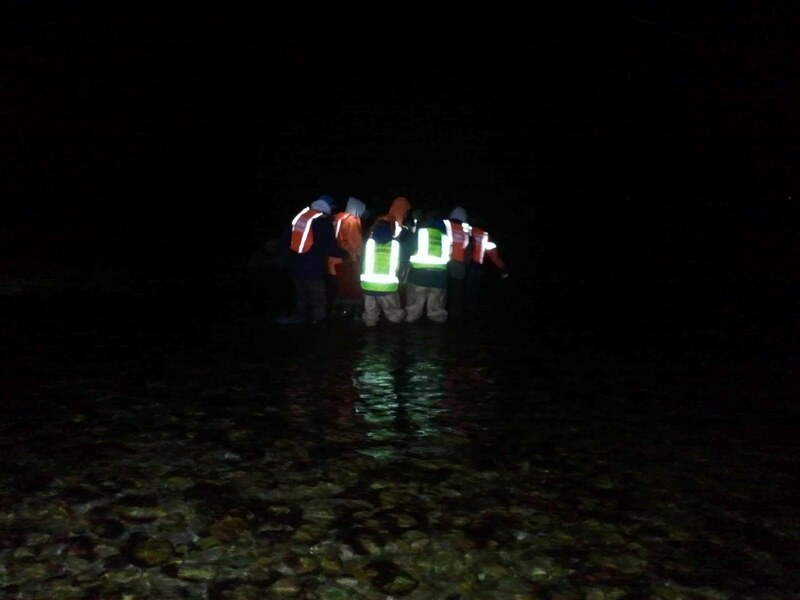 Each dolphin team has a team leader and while not visible in this photo, there is also a safety officer or multiple safety officers on the beach to track each member of each team. Below the team walks toward the ultimate goal - releasing. I love this photo, cool reflection of the Aquarium's green safety vests on the water. We will continue to blog about this event as time allows. I know Kerry has some photos and stories about her time on a special little island she was stationed on during this event. I also collected some great photos during one of our recent herding events. I'll try to put those up in a few days. The ultimate goal is to prevent pain and suffering and to save as many dolphins as possible. In many cases though these animals wash up dead. When that happens we do collected life history information so we can learn. You should be prepared that we may be posting some photos of deceased dolphins so you can see the types of data we collect and how that helps us in science and with future stranding events. Learn more about this season's dolphin stranding rescue efforts here. 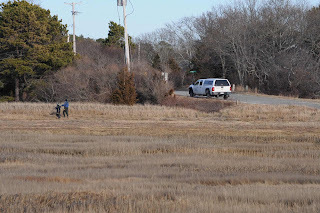 In response to the many questions regarding the continuous dolphin strandings on Cape Cod Massachusetts, USA (specifics for our foreign followers), below is a glimpse into the efforts. While there are too many questions to address in one or two blogs, we will report on the past and current efforts and then go back and discuss potential causes later. Important to understand is that all marine mammal responses are carried out by authorized agencies under the direction of the National Marine Fisheries Services (NOAA). The US coastlines are divided by NOAA and each responding organization has to meet high standards of training and expertise to obtain a NOAA response permit. All marine mammals on the mainland Cape Cod fall within the response region of The International Fund for Animal Welfare. 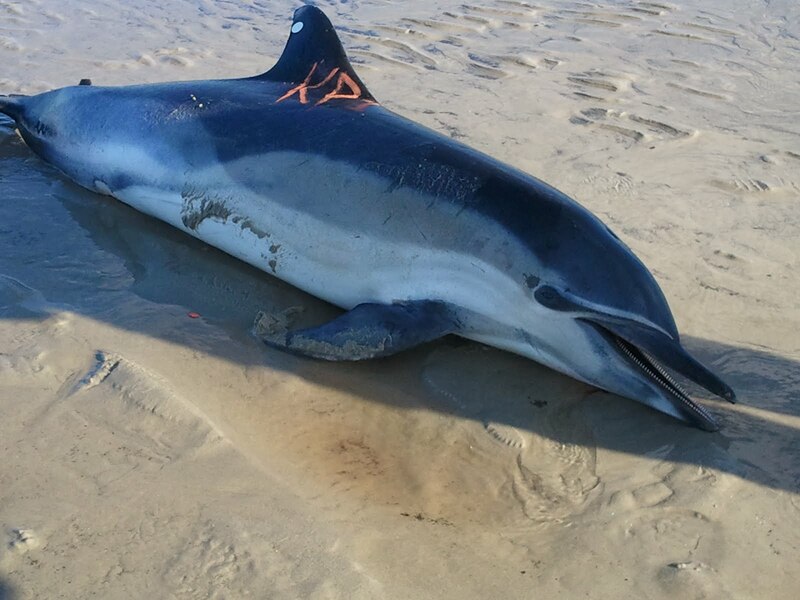 During large scale and prolonged events, such as these dolphin strandings, we are often called in to provide additional resources. 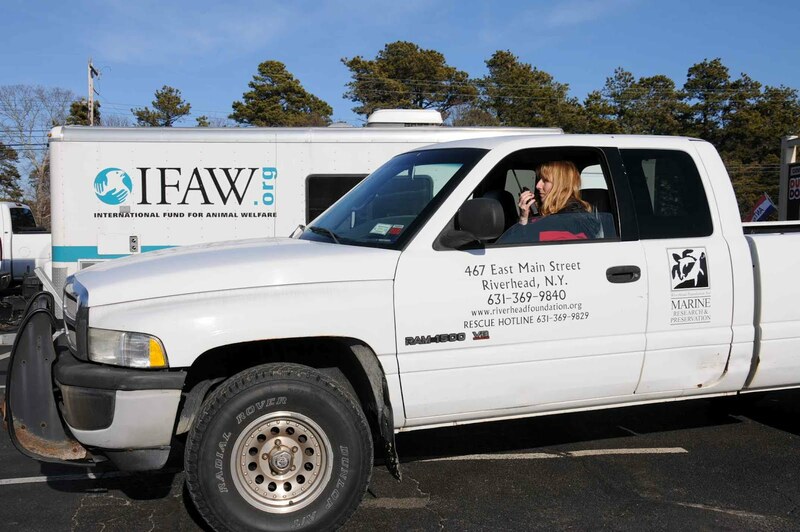 In this case several organizations have sent responders to support the efforts by IFAW. 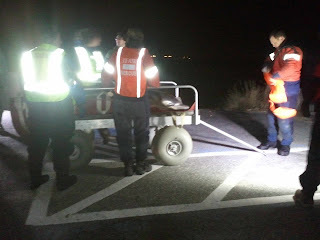 Below are some pictures of one of the response days I attended. 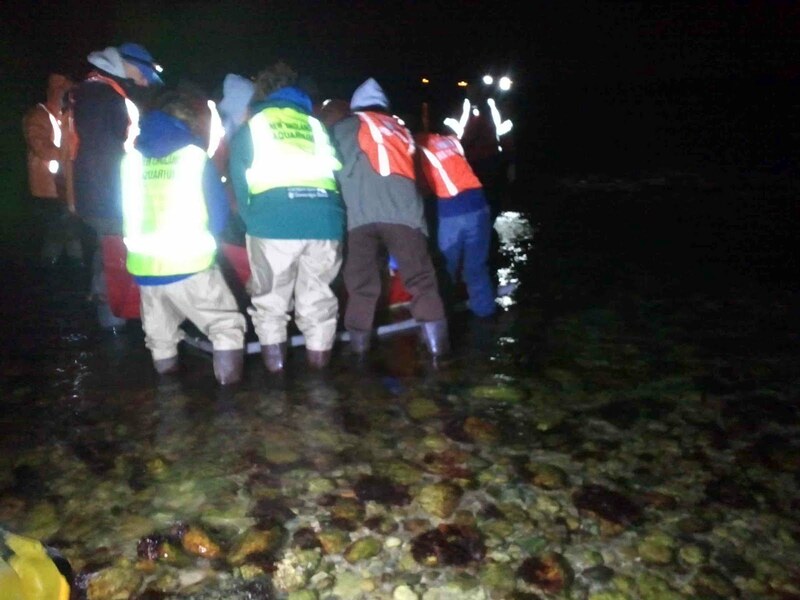 With dolphins stranding daily, the IFAW biologists are in constant response mode. They have multiple response teams set up for each day. Volunteers are scheduled to search specific beaches and bays and report back their findings. 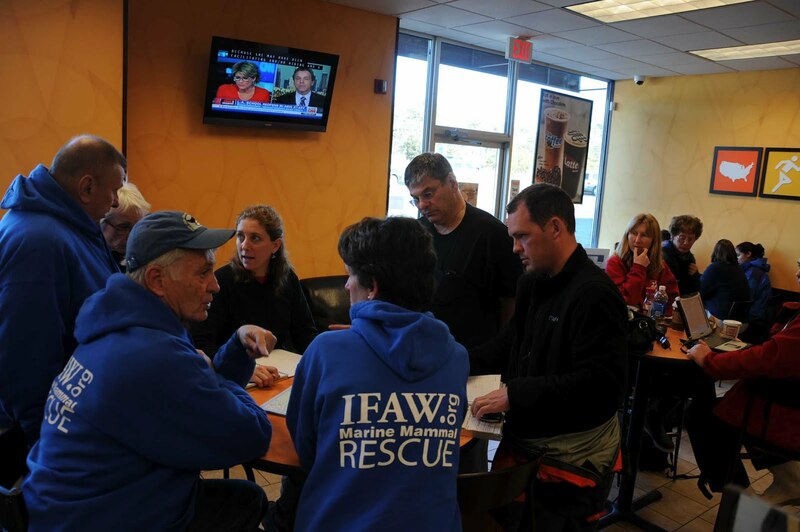 In the photo below on the left Katie Moore (in black), director of the IFAW rescue team gives instructions to an IFAW volunteer. In the photo on the right Katie Moore and IFAW rescue coordinator, Brian Sharp, review the rescue plan for the day. 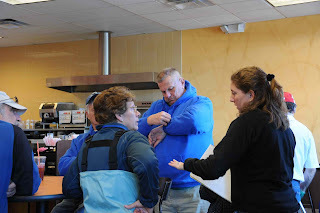 The importance of a warm dry meeting place with restroom facilities is crucial. The owners of the Dunkin Donuts on State Hwy in Wellfleet have been kind enough to allow us to use their store as a command center. In the photo below several network members review the response plan in the command center. In front from left is Julika and Kim from the Riverhead Foundation for Marine Research and Preservation(RFMRP) in New York, Lynda Doughty, executive director of Marine Mammals of Maine, and Dr. Charlie Innis from the New England Aquarium. 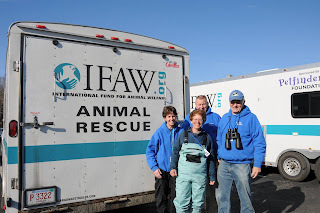 IFAW volunteers as they dispatch to their respective beaches. These are a great group of dedicated volunteers, it was a pleasure working with them! Responders need to be ready at a moments notice for a live or dead animal call. 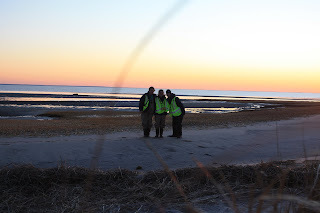 In the photos below biologists from Maine and New York prepare to dispatch into the field. In the photo below Brian Sharp from IFAW pulls a specially designed dolphin cart to the location of a recent live dolphin sighting. 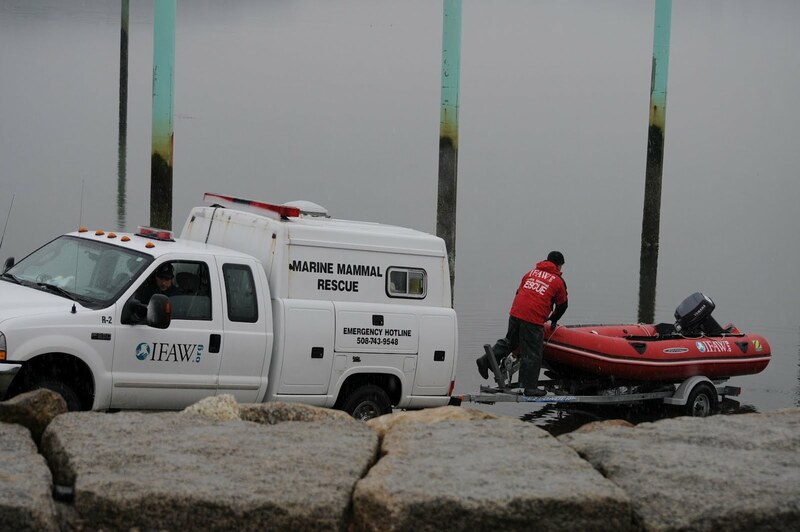 The photo on the left shows IFAW, and NEAq responders stationed around a bay where a dolphin was sighted swimming in shallow water. The center photo shows the IFAW response trailer, the NEAq ambulance, the RFMRP truck parked at the stranding site. 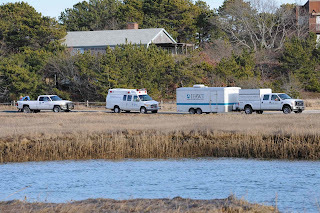 The last photo shows the NEAq 4x4 and two responders at the same site. 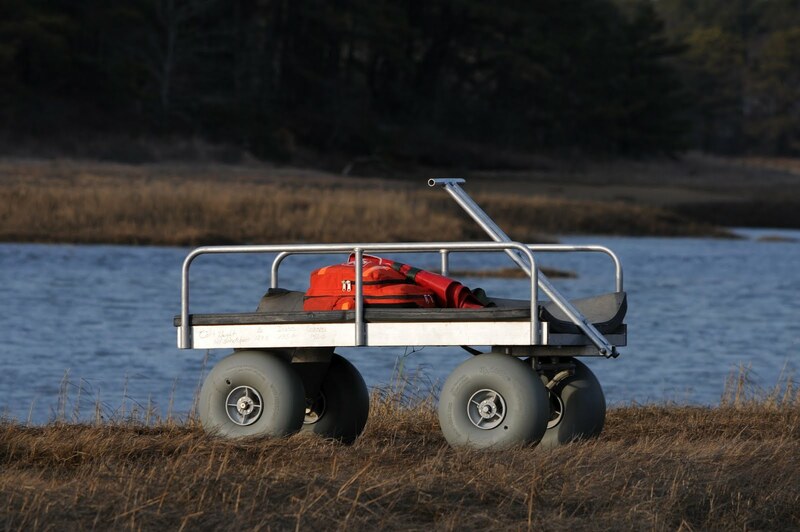 Below is a close up view of one of IFAW's specialized dolphin carts. 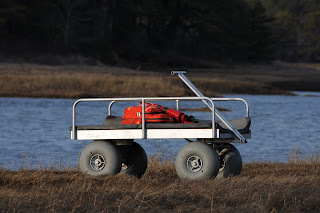 The large inflatable tires allow them to pull a heavy dolphin across a marsh or mud with little impact on the habitat. 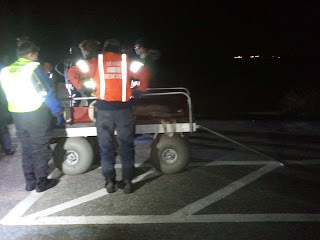 On top of the cart is a large piece of foam, an NEAq triage backpack and an IFAW dolphin stretcher. This view caught my attention as it was stunning. In the photo below an IFAW volunteer is spotting on bridge for more dolphins in the bay. This blog doesn't begin to cover the magnitude of the event, the duration of response and the ongoing efforts. 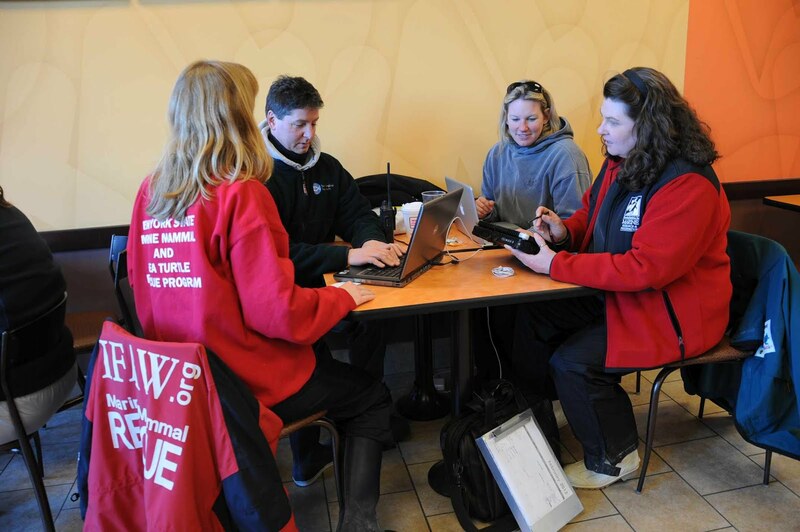 While other responders have been circulating through to help, the majority of the response has been the responsibility of the IFAW team. Their staff and volunteers are doing a amazing job with this effort. It is difficult to capture images during this events as we are very busy and in the elements. We will be sharing the photos and our experiences over the next few days/weeks as best we can. If we are slow in responding to your questions, please understand that we will likely be in the field a lot over the next few weeks. Learn about past dolphin strandings that the Aquarium's Rescue Team has been involved with here.